Satin soft flowing Matric dress with soft detail on upper bodice. Dress size 34, 36. 38. Dresses more than one per style will be booked out only ONE per school. 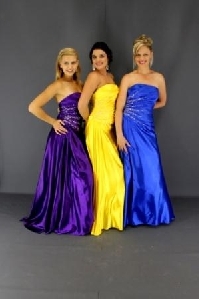 Please visit our studio's and view our special selected dresses and ball gowns. We have a wide variety of styles in stunning colours available to suit your need and personality.